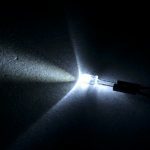 This Infrared (940nm) 5mm LED is invisible to the eye but works great for illuminating dark spaces (for cameras) or transmitting data just like a TV remote control. These work quite well with the Raspberry Pi NoIR Camera or the 38KHz IR receiver. The forward voltage is 1.2V with a current consumption of 100mA. The LED is rated at 60mW/sr @ 100mA with a view angle of 30°. To use this LED you will need a current limiting resistor; this will vary depending on your input voltage. Typically with a 5V supply we recommend 39 ohms for a single LED but due to the high current draw a 1/2 Watt or greater resistor is required. Looking to mount these in a panel or enclosure? We carry a plastic and metal panel mount holder for these LEDs as well. SKU: LED-016. 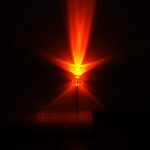 Category: 5mm LED. Tags: Component, LED, Light Packet.